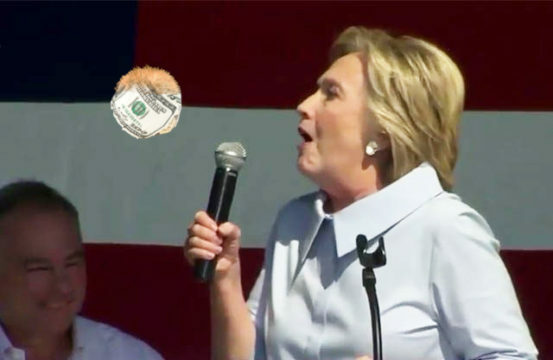 Hillary Clinton experienced a coughing fit on stage during a Cleveland rally in Ohio on Monday spewing up a fairly sizeable furry wad of Wall Street cash. Clinton says she had an allergic reaction to the money, which may have had “traces of Donald Trump”. “My body is usually completely fine with cash donations from any kind of special interest groups but this instalment must have affected something my doctors are calling a ‘conscience’,” said Clinton. One lucky Clinton supporter managed to catch the cash discharge but could only savour the moist hairy bundle of corruption for a few moments before it was whisked away by secret services. “We’ve closely analyzed the cash projectile from the available video footage and some of the hair strains do appear to match with the color of Trump’s wig,” said one forensic expert. The secret services say they will not release the regurgitated cash fur ball to the public, as it is “a matter of national security”.